Use your mouse or touch screen to scroll through the images… To read this wonderful story please scroll down below the slider. 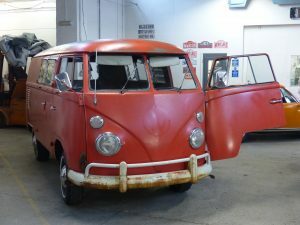 Vinnie is a 1965 VW Split Screen campervan from San Francisco. One of the orginal ‘hippy vans’, Vinnie no doubt played a full part in the Summer of Love and was probably in attendance for one of San Francisco’s Beatles concerts or Vietnam protests. On a misty morning 52 years later in rural Oxfordshire, Vinnie entered our lives. The Dubbies team fell instantly in love – there was no doubt that Vinnie was ‘the one’. By subscribing to our company newsletter you will always be up-to-date on our latest promotions, deals and vehicle inventory. We are using cookies to give you the best experience on our website. Please click ‘Accept’ to continue browsing.